I uncovered a piece of Vermont history on my jog the other day. 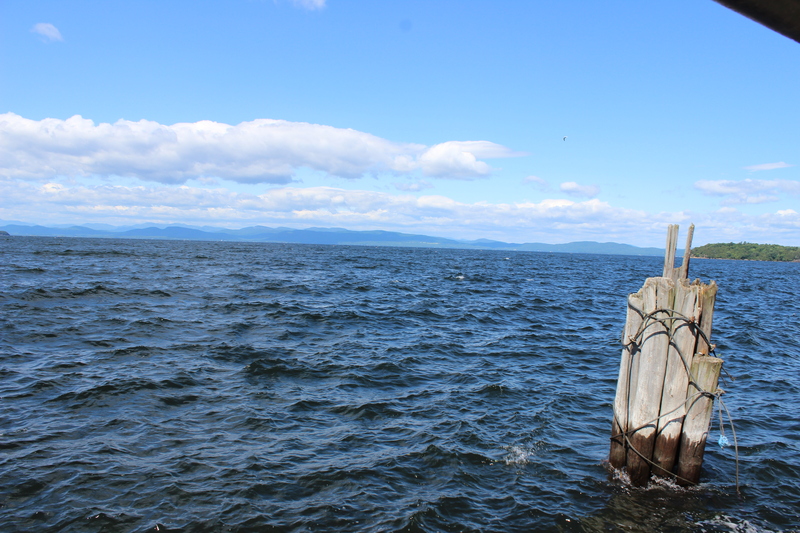 As I was running down the bike path along Lake Champlain, the concrete sidewalk abruptly ended and became a two-inch wide dirt trail snaking along the side of the sailboat yard. The trail split in two, and finding it hard to fit my footing along the trail just wide enough to fit a bike wheel, I turned left toward larger path that soon became a half-buried set of railroad tracks. I followed the tracks that shortly ended in a sailboat harbor. What I saw around me was graffiti both old and fresh to my right and rusty old train parts overgrown with foliage to my left. I stood there for a while taking in the scene, and in that time nobody came into the abandoned lot. This seemed like the kind of spot where all the teenagers might go to drink beer without their parents knowing. The Vermont Rail System came into fruition as the Rutland Railroad’s time came to an end. The tracks upon which I stumbled were part of an extension of the original Rutland Railroad called “The Island Line.” A portion of The Island Line is still in use, but the tracks which crossed Lake Champlain by connecting a series of small islands that fill the center of the lake are now completely abandoned. But what was this old and forgotten railroad used for? Primarily to transport the most valuable and highest-quality products the state of Vermont has to offer: Dairy. Comments on pages that detail the history of this abandoned railroad mention that you can only find it if you know where to look. Unless of course you’re a new resident of Burlington, wandering off on your morning jog to catch your footing. If you follow the miles of land bridges that used to carry the railroad, you’ll end up way out in Rouses Point, New York, just south of the Canadian border. Maybe I’m too much of a poet to take a history lesson, but it seemed ironic to me that the only abandoned railroad in Burlington heads directly to the state I left behind. During my research I realized moronically that New York has been in my backyard this entire time. The mountains I see across the lake from my balcony are the Adirondack Mountains of New York State. I secretly wished upon learning this that New York City would have been located on Lake Champlain instead of the Hudson. But if that were to be the case, I could never hope to see the large pack of Bald Eagles that are said to migrate here to Burlington in the fall. New York might be sitting in my backyard but there’s a giant lake between myself and those mountains, and the only path that leads me directly to them is broken and mostly buried. Still, the tracks led me down an interesting route of investigative research, and I have a feeling that there will be more pieces of history to dig up in this city over the course of the next couple of months. In the meantime, I’ll be looking out for those eagles on my early morning jog.